Serum-sickness– like reactions characterized by fever, generalized lymphadenopathy, arthralgias, and rash occasion- ally but rarely occur after hymenoptera stings,4-6 but such reactions would be expected to occur more than several hours after exposure and would have resolved over time. IM syndrome: EBV, CMV, other herpes virus. IN a immunocompetent host, CMV mononucleosis is similar to EBV-related disease, though pharyngitis and cervical lymphadenopathy may be less prominent. SLE, RA, Sjogren Syndrome, AOSD, Sarcoidiosis. 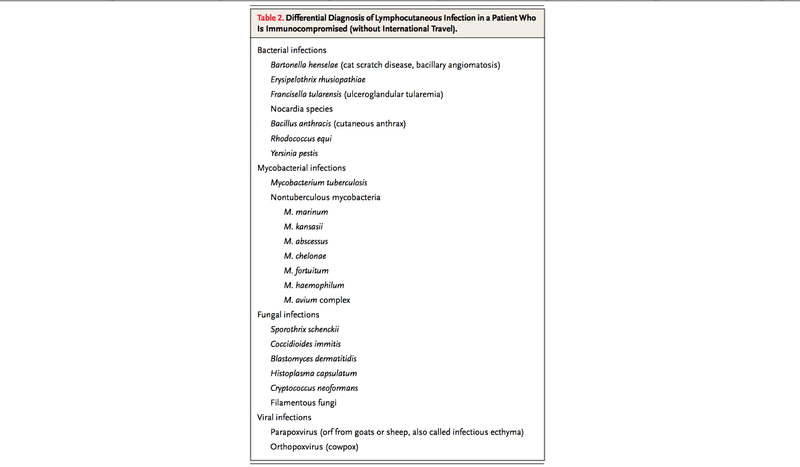 In SLE lymphondenopathy is common, splenomegaly does not usually occur. Sarcoidiosis may have pulmonary parenchyma disease. Multicentric Castelman's Disease (HHV - 8): Usually occur in patient with advance AIDS. Hepatosplenomegaly, Lymphadenopathy, Anemia. Lymphoma: Mostly B cell. 12 % are T cell. Most lymphomas present sub acutely over a period of weeks to months, in contrast to the abrupt onset seen in few patients. What lymphomas evade identification on rou- tine biopsy Hodgkin’s lymphoma, Diffuse Large B cell Lymphoma. Angioimmunoblastic T-cell lymphoma: characteristically presents acutely with diffuse lymphadenopathy and fever, mimicking an infectious disease, and the presence of a diffuse, pruritic, maculopapular rash. Lymphadenopathy is usually not bulky (1 to 3 cm in diameter), and the swollen lymph nodes are in the size range seen in inflammatory or infectious processes, as in this case. The rash and lymphadenopathy may wax and wane. Up to 80% of patients have polyclonal hypergammaglobulinemia. Immune dysregulation may result in the presence of autoantibodies (includ- ing antinuclear antibodies), rheumatoid factor, anti–smooth-muscle antibodies, antiphospholipid antibodies, and false positive serologic tests.